How do you know that a truck driver has violated the rules of the road or violated the federal or state guidelines that govern them? Well, what you do is first of all you quickly and thoroughly investigate the case. We get the logbooks from the defendant driver. We make sure he was logging his miles. We make sure that his logbooks are correct. Some folks have written, some folks have electronic logs. We look at the hours of service and when they were allowed to drive and when they weren’t. We look on whether or not they did their vehicle inspections as they’re required to: What they look like? Did they check it off? Did they look at tire pressure? Did they look at these other things? We also look to make sure and check and verify their weigh-ins at different places. We look at the locations where they stop. We look and see where they deadheaded anywhere. We look at all of these to make sure that their logbooks are kept up and that they’re accurate and they didn’t violate their rules and regulations. There are federal rules that govern this, and we regularly, in every case we have, have those logs produced, inquire with the defendant about that. There are many other ways we prove that truck drivers violated the rules of the road as well. I can give you a war story after war story. I just took the deposition of a guy who admitted he was on his phone. At the time of the incident, he flipped a load going around a turn. It was obviously going too fast. And, he knew that turn really well. We have another case we just signed up. It’s a sad case. It was an accident in Texas with a driver in Tennessee, where the defendant driver was going too fast. He locked up his brakes. He went an angle across the median and went into oncoming traffic. We have a couple of cases like that now. Another two we’re litigating in Warren County, Missouri as well. In those cases we also look at the data from the ECM or the black box or the electronic data recorder from the vehicle. We pull that. We hire experts. We go in and find out the speed, how much throttle, how much pedal they were using, what brakes they use, when they applied the brakes, what happened to steering input. We look at the inspection post-incident to see if the braking was good. We send experts to review this in case the highway patrol hasn’t looked at that. Some highway patrols do amazing accident reconstruction jobs, and we take advantage of that data as well. So, in a trucking case, it’s important to thoroughly go in and get the logs, the ECM, any other data or investigation, skid marks on the roads, witnesses, investigation photographs of the vehicle. It’s important to get all this information right away, so we can prove the negligence, not only of the truck driver but the system failure on the part of the trucking company that doesn’t train or monitor its driver satisfactorily. 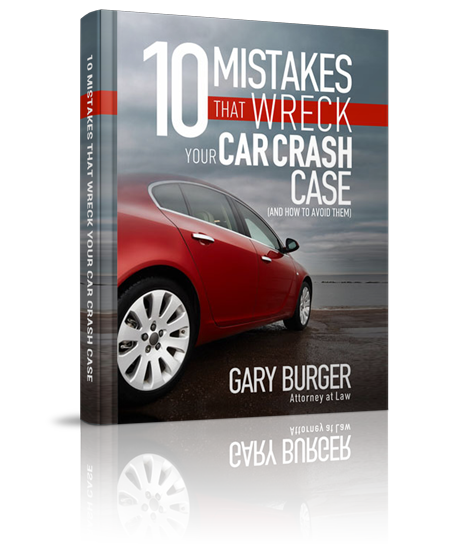 If you have any questions about a truck crash case, call me, Gary Burger of Burger Law at 866-599-2222. I’m also at www.burgerlaw.com. Thank you.